As far as I know, they no longer offer elephant rides at Syracuse's Burnet Park Zoo. For that matter, there's no longer a place called Burnet Park Zoo. Several years ago it was renamed the Rosamond Gifford Zoo at Burnet Park. These photos were shot in the 1980s when sisters Meridith and Laura Major took advantage of the opportunity to board an elephant, though the person who really has something to talk about is the infant on her mother's map (photo, below). Rosemond Gifford reportedly led a reclusive existence in a small community called Jewell on the north shore of Oneida Lake. In the 19th century it was known as West Vienna and was a stop on a popular east-west road along the lake. Things were quieter by the time Gifford arrived in the 1920s. She inherited a $1.2 million estate and when she died in 1953 her estate was worth more than $5 million which was used to fund The Rosamond Gifford Charitable Corporation, which in 1999 gave $2 million to the Burnet Park Zoo. Thus the name change. Unfortunately, it's the zoo's elephants that have been at the center of a lot of bad publicity in recent years. Six baby elephants have been born at the zoo; three of them died. A website called SaveWildElephants.com doesn't think elephants should be kept at the Rosemond Gifford Zoo, citing the frigid Syracuse winters and what the website describes as outmoded and circus-like methods of training and handling the animals. 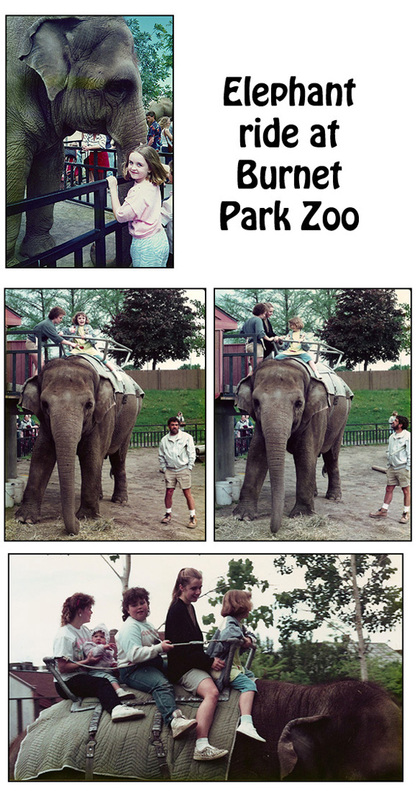 I have a feeling the photos on this page illustrate what zoos should not be doing with elephants – which is why the rides were discontinued.